← What makes The GEZE TS2000NVBC our bestselling door closer? 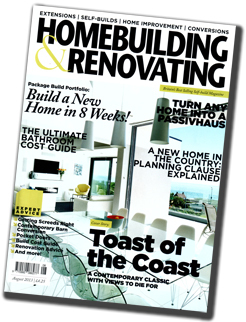 Doorstuff’s very own Helen Butland is interviewed by Claire Lloyd in the August 2013 issue of Homebuilding & Renovating magazine for their article about pocket doors. With a selection of lovely photos of pocket doors in situ, Claire writes about the benefits of designing in a pocket door when rooms are short of space. She also covers importance of specifying the right kind of kit for the intended use, and what considerations to think about in the design process. Our iMpero pocket door gear and the Coburn Hideaway kits get a nice shout out, as do the Coburn “pocket plungers” – a clever gadget which springs the door out of the cavity. This entry was posted in sliding door gear and tagged claire lloyd, Hideaway, Homebuilding & Renovating magazine, iMpero pocket, pocket door gear, portman pocket door. Bookmark the permalink.